A brand new year has just begun and I guess I am a little late in wishing all my readers a very Happy New Year 2014! Well, better late than never! 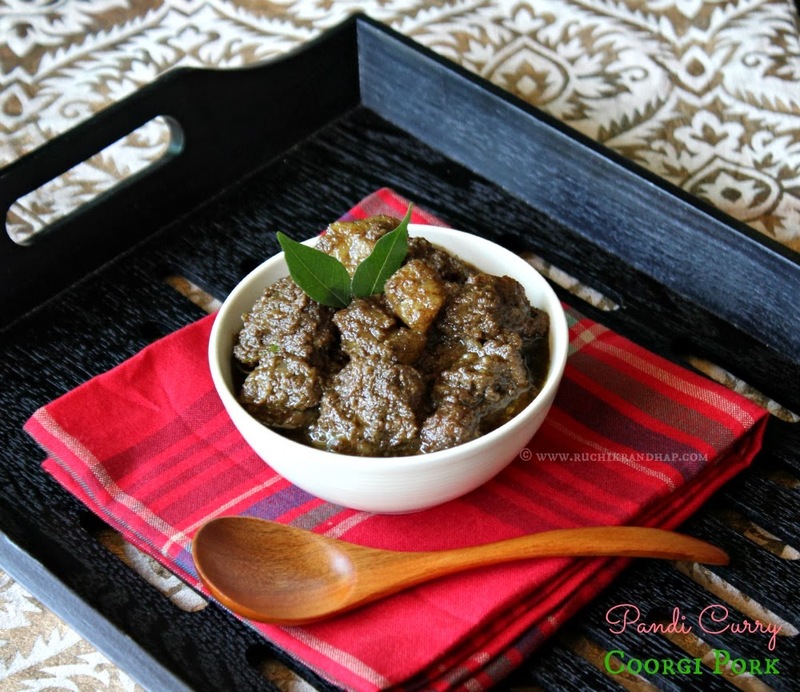 As any good occasion needs to be celebrated I decided to post the recipe of Pandi Curry (pronounced as ‘Pahnn-dhi’ ) or Coorgi Style Pork curry that I have been contemplating to post since a very long time. The funny side of the story is that years ago when I was first offered this dish by a friend in college, prepared by her Coorgi neighbour I politely declined to taste it! Somehow the rich, dark colour didn’t quite appeal to me and I wasn’t so adventurous those days when it came to trying out new dishes. I simply stuck to known dishes and played safe. How I regret my decision. That was probably my only chance of having Pandi Curry made by a Coorgi. I could kick myself for being so silly. A few years later when the blog came into existence and I did break out of my shell and got adventurous my first attempt at making this dish wasn’t much of a success. I blamed it on the non availability of Kachampuli or Coorgi Vinegar, a rich dark liquid extract from a fruit called Kodampuli. It is also called as black vinegar and gives the dish its dark, rich colour and flavour. Coorg by the way is the anglicised name of Kodagu district in Karnataka. Madikeri/Mercara being its headquarters is a beautiful hillstation that most Mangaloreans have grown up visiting on holidays or to tend to their coffee estates. I have personally loved going there a couple of times although I don’t recall having eating this famous dish during my trip. Coorg is famous for its beautiful hills, lovely weather, coffee estates, good looking men & women who are one of the most cultured and civilized people I have known. 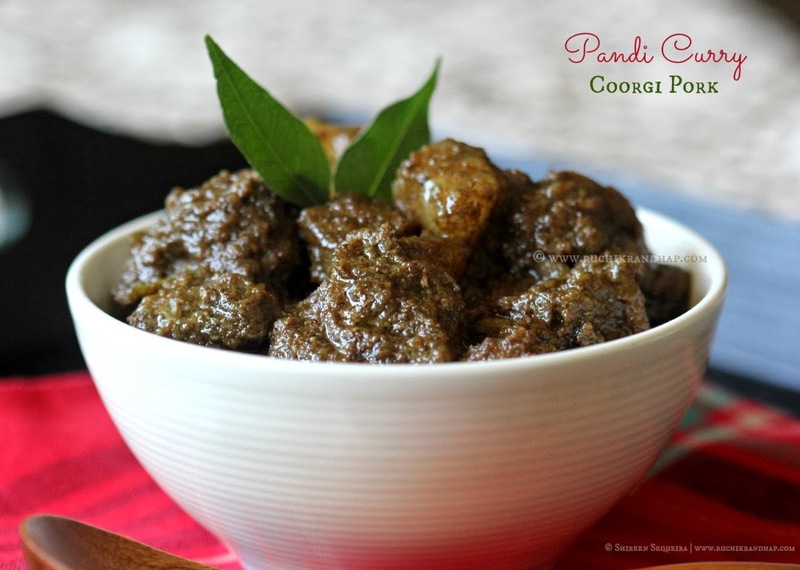 Pandi Curry is pretty famous in Mangalore as our town is also home to plenty of Kodavas (native people of Kodagu) who usually come to Mangalore for their education. While we didn’t have easy access to the recipe a few years ago, today if you wish to make it, many stores sell ready spice blends that help you make this dish in a jiffy. All you need is good quality pork with fat as fat is what helps lend this dish its amazing flavour along with the rich flavour of the spices. Kachampuli if not available can be substituted with thick tamarind juice or limes although the outcome of the final dish will greatly vary. Sadly some ingredients just don’t have a suitable substitute. My man tried this dish with locally available Pork last month and not being completely satisfied with the result lugged more than 5kg of pork all the way from Mangalore last week during our super short X’mas visit there. This time around the preparation was simply stunning that it got over in no time. I just about managed to save a small bowl for the sake of the pictures. I wish all my readers a delicious, flavourful and aromatic New Year 2014! 2. Add the spice mix to the cooked meat. You may add a little oil but it’s optional as there will be enough fat released from the meat. Cook on a slow heat for about 5-10 minutes till the water evaporate, the fat separates and the spices have blended well with the meat. 3. Do a quick taste check – add Kachampuli and more salt if required. 4. Remove from heat and serve hot with Coorgi rice rottis or neer dosa or rice. 1. Kachampuli or Coorgi vinegar is derived from a fruit called as Kudampuli in Malayalam and Gambooge/Malabar Tamarind/Garcinia Cambogia in English. If you don’t have kachampuli you may substitute it with equal quantity of thick tamarind juice or lime juice. Kachampuli is available in most stores in Mangalore and in Lulu Hypermarket in Dubai, U.A.E in the section which stocks up on foodstuff related to Malabar/Keralite cuisine. 2. To speed up the task a bit we pressure cooked the pork that we purchased from Mangalore. However I do not recommend that you to pressure cook pork that is available in the UAE (usually imported from Brazil) as it is extremely tender and may turn squishy when pressure cooked. Slow cooking is the safest bet when you have no idea about the quality/tenderness of the meat. @ Sanjay Vaidya and Tuskerwoods: Thanks so much! Hi Shireen, thanks for the corgi pork recipe, the other way you add more taste is put the onions ( cut in square) after pork is cooked along with sstraight slit green chillies. Tastes best 🙂 . @ I am the Patz: Thanks so much for your suggestion! That's the way we cut onions for Pork Bafat, a Mangalorean preparation. I am sure there is a reason why onions or other ingredients are cut in a certain way. I will definitely try out your method next time 🙂 Thanks again! @ Sonia: Thanks so much 🙂 Glad u liked it! Looks delicious. Will try this at home. Would it be possible to make a video of your recipe and preparation and post it on youtube. It will be most helpful for people like us. @Rajan: Thanks so much! I hope you liked it 🙂 Do let me know how it turned out! 100% Awesome! Being in Canada, I almost forgot how delicious Indian Pork curry is. Your recipe for Coorgi Pandi Curry has reminded me of how much I actually missed this delicacy staying where I am. Thanks Shireen! Thank you Shireen ! This recipe is a masterpiece ! I did not have Coorgi Vinegar, so added lime…came out great. @ Prashanth: That sounds terrific! I am so glad that you liked this dish 🙂 Thnx for the feedback! In India, Kachampuli can be ordered online through http://www.coorgshoppe.com. They also have the pork masala powder! @ Dr Lirish Chinnappa: Thanks for the great info! I am sure my readers will benefit from it! Thank you Shireen for sharing this recipe ! Turned out so delicious, my family loved it. I used the ordinary tamarind as I did'nt have Kachampuli. God bless ! @ Pearly: So glad you liked it! Thanks for the feedback! My curry had become too sour.any idea how to repair this? Blunt, in the face thing! Hi Shireen, Thank you for posting these awesome recipes! Would you know what is the best cut for pandi curry and pork baffat? 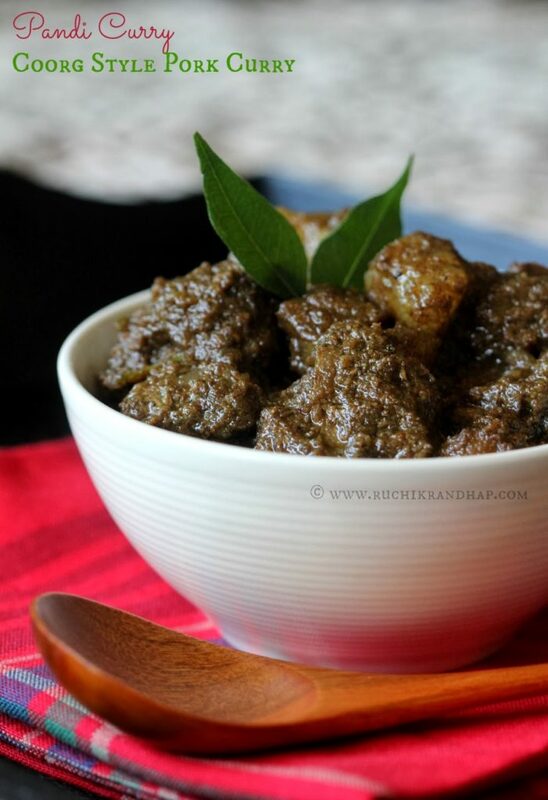 As Pandi Curry is a special and unique dish from Coorg, my question is in case if this Coorgi/Kodava Pandi Curry is made available as heat and eat. How would it sound. Any takers for this Heat and Eat Kodava Pandi Curry. Hi Shireen… Thanks for this wonderful recipe, which I tried last week and sent to my sister's office colleagues… they truly loved it and said that this was the best of all the pork recipes which I had cooked for them before. The credit goes to you for sharing this recipe with us all… God Bless You always. Hi shireen.this looks v interesting.. Wanna try it out but we don't use pork.. Can we alter this with mutton.. The pandi curry masala that we coorgis prepare can be used to prepare even mutton, chicken and fish curries. It really tastes very good. @ Kavya: I have never tried it with mutton so I am not sure how it would taste, I am sure you could try it out though! @ Unknown: Thanks so much for your lovely feedback! So glad to know that your sister's office colleagues liked it too!! lived in Kodlipet (long time ago). nice to try this now. Excellent recipe, sure shot works for me every time!! Excellent recipe, tried several times now, getting better each time!! Hi Shireen. I am from Sri Lanka, your neighbor :). i made this today for family lunch with 1 Kg of pork ( less fat) with available alternative spices. Came very well. i am trying to memorize the recipy so that i can redo it while traveling. thanks a lot. @ Thanks everyone for your feedback! SO happy! @ gaad45: Wow! A Sri Lankan reader – I love your cuisine! I am so glad that you enjoyed the recipe 🙂 Thanks for your feedback! My Elder sis is great fan of your recipes. Since I am a food lover and always love to do a new experiment in cooking I thought i will try it with Poork Coorgi Style. Can you please help me out in Mangalore which Shops i may get Kachanpuli. Waiting for your reply. Thanks in advance. @ Annet: Thanks so much for your lovely comment! You will get Kachampuli (in liquid form) at Saldore Cold Storage at Milagres. You can actually check with any good store that sells pork or even any supermarket that stocks on Kerala food products. 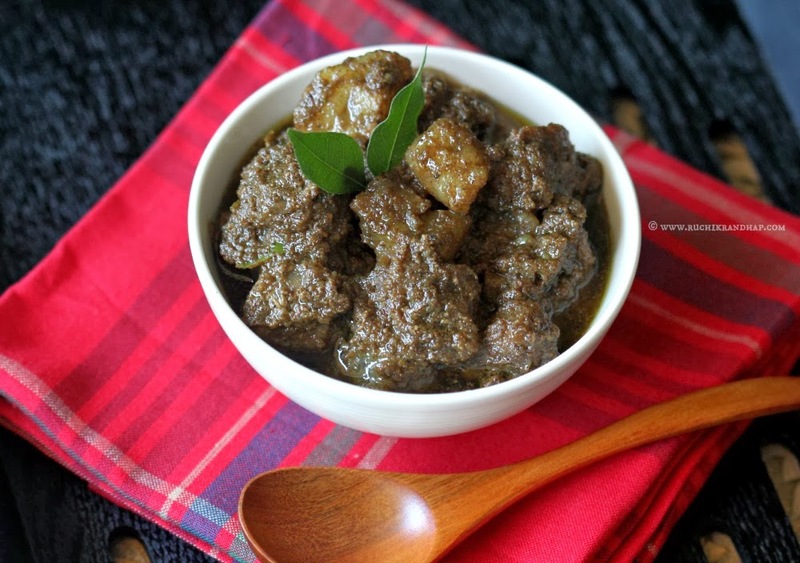 Hi,I was searching for an authentic COORGI PORK CURRY recipe and bumped into your post. read the recipe six times and still has some doubts. You says prep time 20 min, Cooking time 20 min, For preparing spice mix there are eight items to be dry roasted seperately. Is 20 minutes enough for that? and then they got to be powdered. the maet got to be washed and drained.. yes or no?? ok. how long it takes to cook 1kg of pork till it is tender?? is 20 minutes enough??? honestly it makes me wonder wether you have cooked meat at all??. or may be you have magic fingers. Also, I would like to add that when you keep all the ingredients ready, it does not take much time to put the spices together. My recommended prep time does not include time taken to fetch the ingredients from the fridge/pantry, time taken to wash the meat several times if need be. This is impractical. The time taken for such jobs depends on the availability and cleanliness of meat (meat available in India is cut on wooden chunks that leave chunks of wood in the meat and calls for extra cleaning. In the UAE where we live, the meat is pristine clean and cut into precise pieces and takes not more than 5 minutes to clean & drain). Hence my prep time does not account for the speed of the person who cleans and cooks either because any number of factors can delay your work. We can assure you that this recipe has not been posted without trial in our own kitchen and has then been tried by several people over the years and nobody has expressed any concerns till date regarding the prep time or cooking time because it varies from person to person. Some people multi task to save time and some don’t.